Winchester was an important Roman town that was fortified in the second century AD. The Saxons adopted it as the capital of the Kingdom of Wessex and re-used the earlier defences to create a vast fortified burh. Winchester Castle was built shortly after the Norman Conquest and it played important roles during the Anarchy and seventeenth century Civil War. Following the invasion in AD 43, the Romans embarked upon a re-organisation of civilian administration across southern England. Established tribes, which had formerly used elaborate hillforts as their tribal centres, were relocated to newly created towns. Winchester, which was known as Venta Belgarum, was one of these new foundations. It served as the civitates for the Belgae tribe and replaced their former caput within St Catherine's hillfort. The new settlement was adjacent to the River Itchen, an important waterway which gave access to the sea (via Southampton Water and the Solent), whilst Roman roads converged on the site from Bitterne (Southampton), Chichester, Marlborough, Salisbury, Silchester and Totton. Like other planned Roman towns, Winchester was laid out in a grid pattern structured around a main central road that ran through the settlement. Key administrative buildings would have included the forum and basilica whilst there would also have been substantial public infrastructure such as sewers and a bath house. The town would not have had defences when it was originally founded but earthwork defences were added around the end of second century AD largely for taxation and administrative purposes (such as preventing burials within the town boundary). Unlike Roman forts these defences had an irregular layout as they were adapted to the terrain, the existing street pattern and any outlying assets that also needed to be enclosed. The total area of the defended town was around 138 acres. The walls were rebuilt in stone during the late third century AD. The Roman Town Walls were built in stone in the late third century AD. Only fragments remain visible. The town may never have been completely abandoned after the end of Roman Britain in the early fifth century AD but the populace declined dramatically. However, by the seventh century AD the Kings of the West Saxons (Wessex) were using the site and this in turn led to the establishment of the Bishopric of Winchester in AD 634. This led to the regeneration of Winchester and in AD 829 King Agbert made it the capital of Wessex. By the late ninth century AD, Saxon England was coming under increasing pressure from Scandinavian invaders with East Anglia and Mercia both succumbing to their forces. Only the Kingdom of Wessex, under King Alfred the Great, remained under unfettered Saxon control. 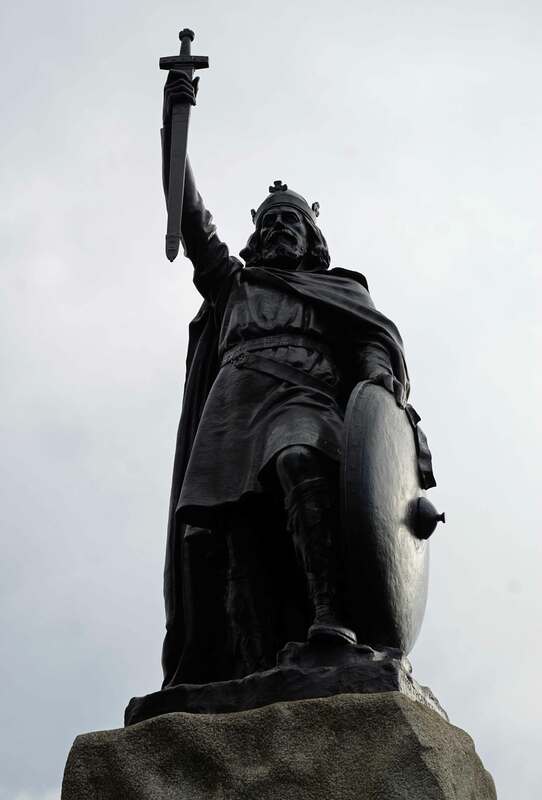 Alfred won a decisive victory at the Battle of Edington (AD 878) and thereafter secured his Kingdom by establishing a series of burhs, fortified towns that concentrated economic activity enabling easy taxation as well as providing urban defence. This not only meant the King had the means to fund a well-equipped Royal army but, as each town could resist an attack, it gave him more scope for military manoeuvre as he did not need to immediately rush to the aid of every attacked settlement. Many of the burhs were established using existing Roman defences and Winchester was a prime candidate not least as the Saxon settlement was already established with the former town walls. The new burh was one of the largest in Wessex - the Burghal Hidage, an early tenth century list of such sites, recorded it as valued as 2,400 hides - a unit that described how many men were required to defend each town. 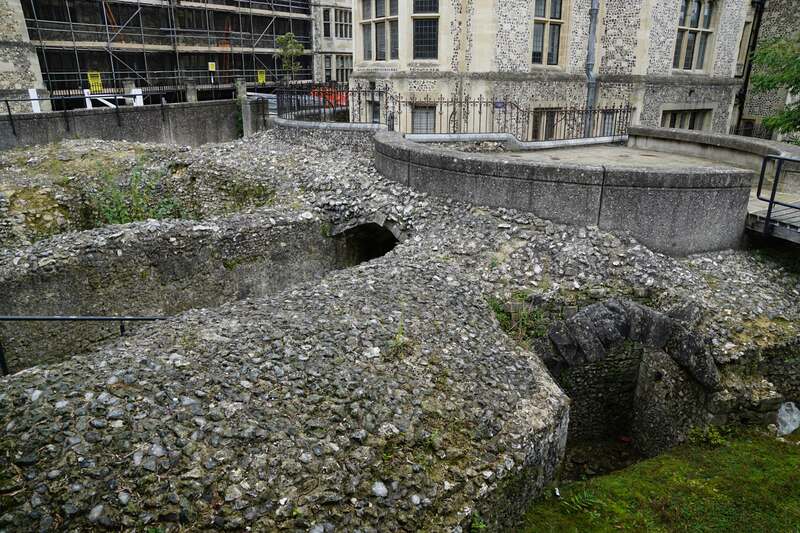 Alfred's re-fortification of Winchester was based on the existing line of the Roman town wall although the defences were enhanced by construction of a double ditch system that fronted the walls. The gates into the town, which were essential both for defence but also for effective taxation, were also rebuilt. The Roman road layout was also modified with a new grid structure. However, the King himself chose not to reside in Winchester and instead built a royal lodge some two miles away at King's Worthy. Alfred the Great refortified Winchester in the late ninth century AD. 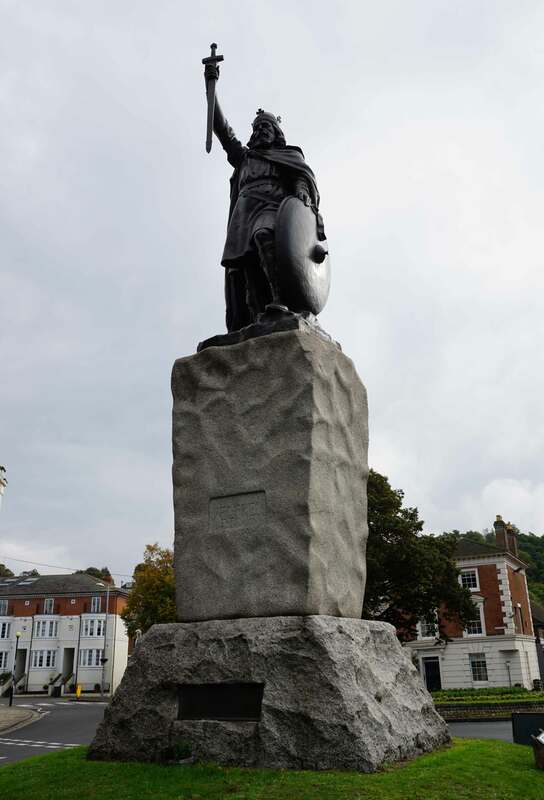 The importance of Winchester meant the Normans secured control of it soon after their invasion and, following his initial coronation in London on Christmas Day 1066, William I came to Winchester for a second coronation. Construction of the castle commenced soon after. The initial fortification was constructed in the south-western corner of the existing town defences. 50 houses within the town were demolished to make space for the new structure whilst a further 10 outside the walls were also pulled down to enlarge the external ditch and ensure the castle had an unobscured view. The Roman Town Walls provided the castle walls to the north, west and south whilst an earth and timber rampart was constructed on the eastern side. A motte is presumed to have occupied the southern end of the enclosure. The structure was clearly deemed sufficiently strong as Stigand, Archbishop of Canterbury was imprisoned at the castle in 1070. Nevertheless, rebuilding of the site commenced within a few decades with a stone Great Keep, probably comparable to that at Portchester Castle, constructed around 1100 in the northern end of the castle grounds. Thereafter Henry I regularly used the site: he married Maud of Scotland in its Great Hall and his only son, William Atheling (who would later perish in the White Ship disaster), was born at the castle. 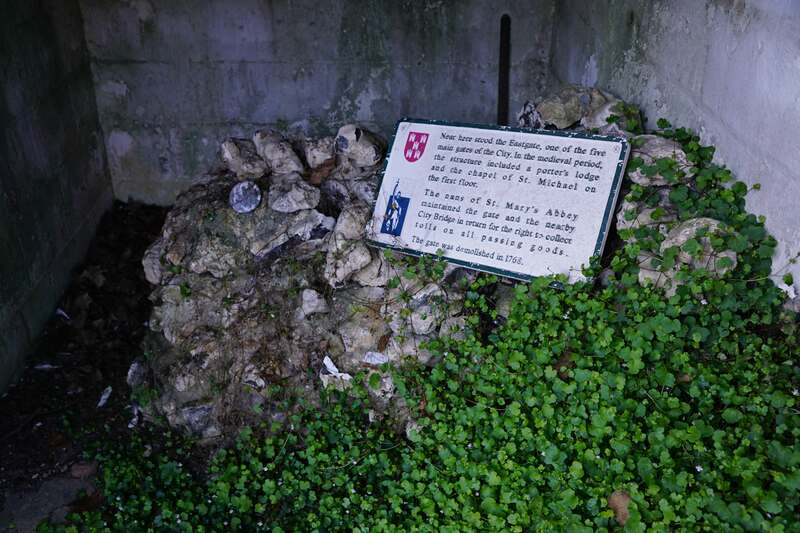 Winchester was at the scene of one of the most important sieges during the Anarchy, the civil war between Stephen and Matilda over the English throne. After several years of warfare, Stephen was captured by Matilda's forces at the Battle of Lincoln (1141). 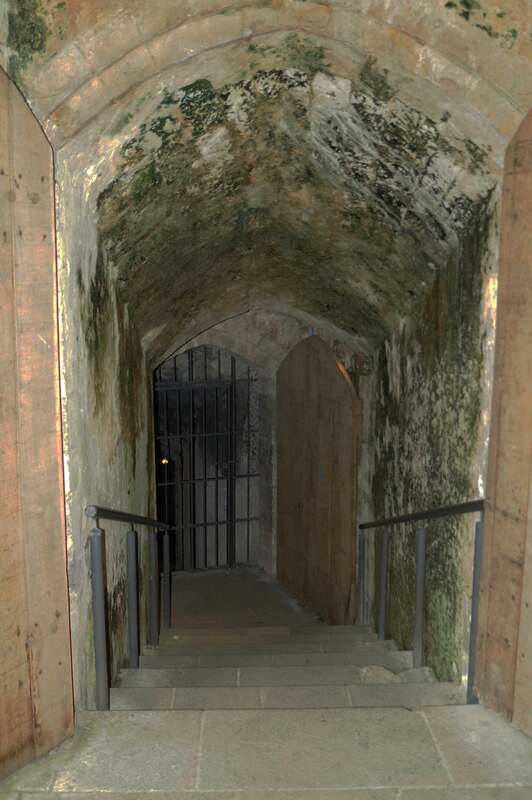 He was incarcerated within Bristol Castle and magnates across England switched support to Matilda including Stephen's own brother, Henry of Blois, Bishop of Winchester. It seemed to all that Matilda would triumph but her harsh treatment of Stephen and failure to win over London saw her support crumble. In Winchester, Henry of Blois switched his allegiance back to his brother and, from his stronghold at Wolvesey Castle in the south-east of the town, besieged Winchester Castle (which was held for Matilda). Her response was to raise a large army which stormed into the town on 31 July 1141. The siege was lifted and Henry's forces withdrew behind the walls of Wolvesey Castle. However, although Stephen was imprisoned his ally, William of Ypres, led a Royalist army against the town. That force arrived on the 2 August 1141 and besieged Matilda's forces within Winchester whilst she besieged Wolvesey Castle - a rare example of a double siege. With Matilda trapped within the Royalist siege, the Angevin faction desperately attempted to extract her. 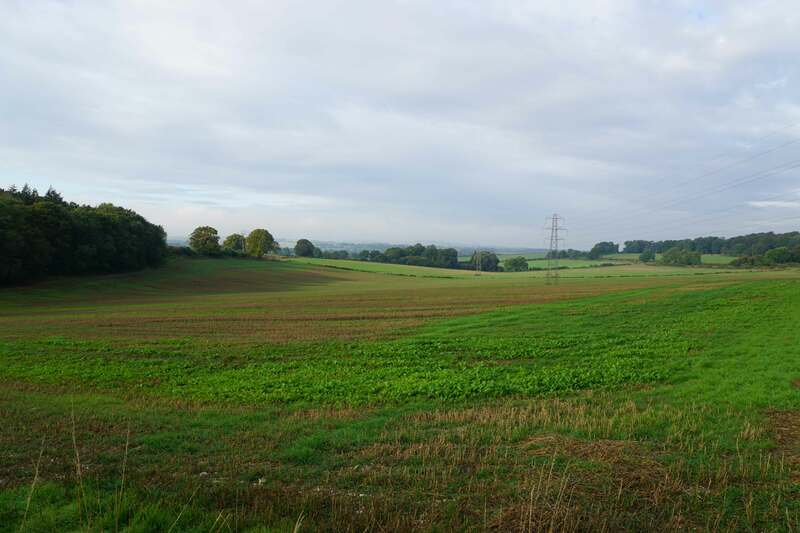 An attempt to break the siege was made by John FitzGilbert who sallied out from Wherwell, some nine miles from Winchester, but his forces were driven off and the outpost was subsequently eliminated. Thereafter Robert, Earl of Gloucester - the main Angevin military commander - moved his entire force against Winchester. Possibly with the help of Bishop Henry, who seemingly wasn't against playing both sides, Matilda was able to escape the siege and flee to Ludgershall and then Devizes. However, during the rear-guard action to secure her escape, Robert's force was cut off and surrounded. He was captured by William de Warenne, Earl of Surrey and imprisoned at Rochester Castle. Without his military mind, the Angevin cause faltered and in November 1141 he was exchanged for Stephen. The outcome meant the war drifted into stalemate and would drag on for a further 12 years. Wolvesey Castle served as the palatial residence for the Bishops of Winchester. It was fortified by Henry of Blois in the years prior to the Anarchy. The Anarchy ended with Matilda's son becoming Henry II and, during his reign, he spent significant sums rebuilding and repairing Winchester Castle. The structure was sufficiently grand for Richard I to hold his re-coronation at the site after his release from captivity in 1194. The castle was captured in 1216 by the forces of Prince Louis during the First Barons' War but was retaken the following year by William Marshal, Earl of Pembroke. 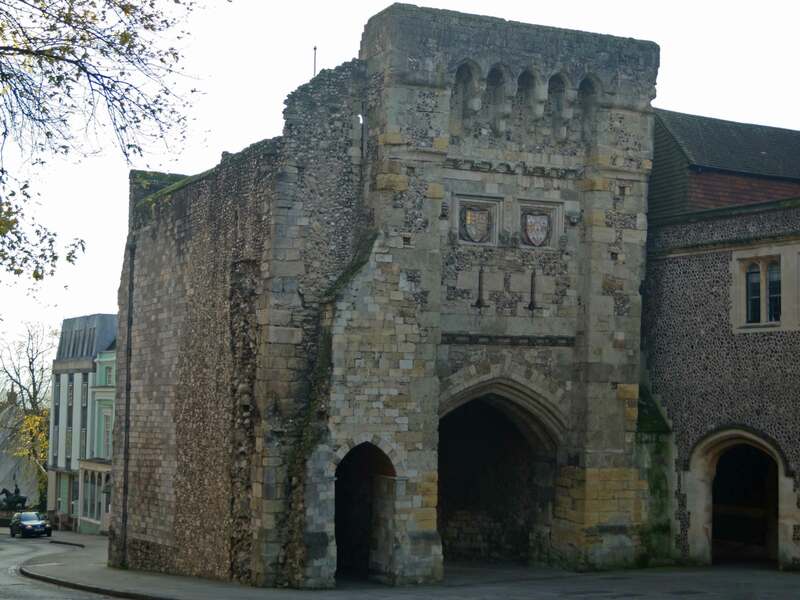 Henry III made substantial modifications to Winchester Castle including rebuilding the towers along the curtain wall, enhancing the gatehouse and adding a barbican. 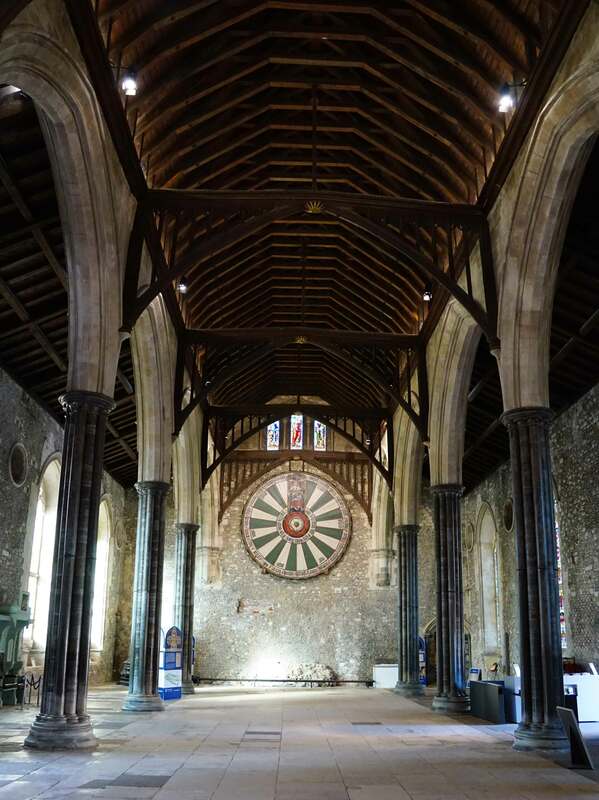 He also commissioned a Master Mason, Elias of Dereham, to rebuild the Great Hall. Work started on this structure in 1222 and took thirteen years to complete. The site continued to be used as a Royal residence throughout the rest of the thirteenth century but, in 1302 during the reign of Edward I, the Royal apartments suffered a catastrophic fire that completely gutted them. The required repairs were so extensive they were never undertaken and accordingly the castle ceased to be a medieval Royal residence. 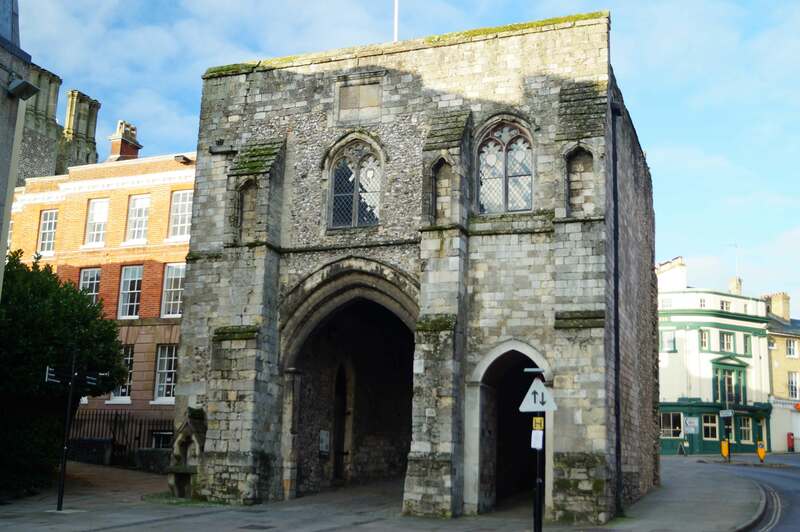 When later monarchs visited Winchester, they stayed at the Bishop of Winchester's Palace at Wolvesey Castle in the south-east quadrant of the town. 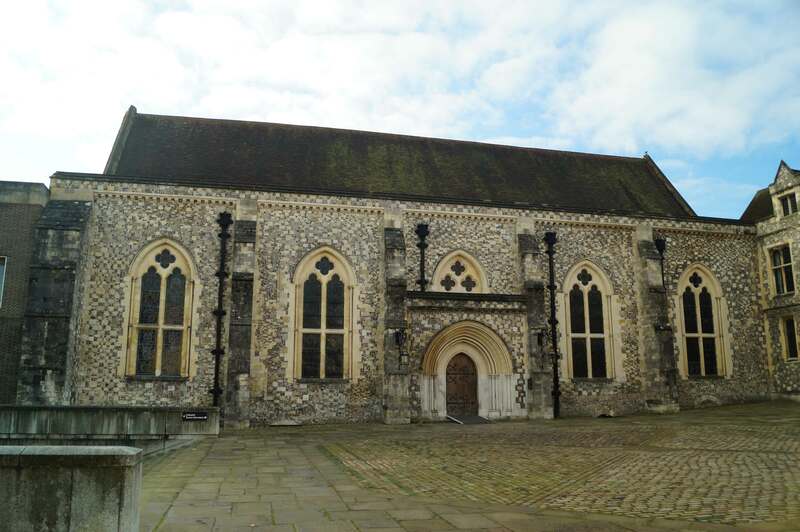 Winchester Castle's Great Hall was rebuilt between 1222 and 1235. In addition to his work on the castle, Henry III also funded significant upgrades to the Winchester Town Walls. Murage, the right to raise taxes to fund upgrades, was granted in 1228 and was regularly repeated in the years that followed. Edward I also made grants during the 1280s and 1290s. Royal Commissions in 1339 and 1369 recommended further upgrades but nothing was done until the 1390s. By this time there were six gates through the walls - West Gate, South Gate, King's Gate, East Gate, North Gate and Durn Gate. 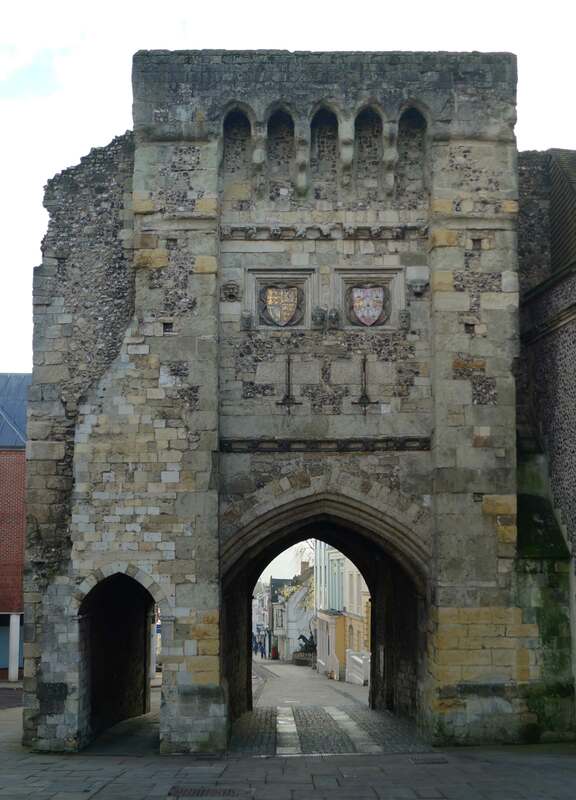 West Gate is the only surviving gate from Winchester's Town Walls. Winchester continued to be an important town and, following the rebuilding of the Royal accommodation, the Tudor monarchs made regular use of the castle. Henry VII and his queen, Elizabeth of York, were in residence when their son, Arthur, was born. 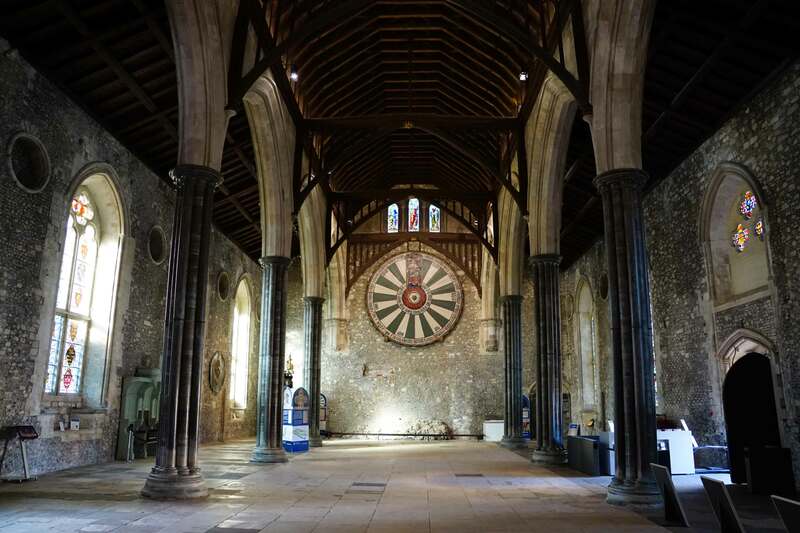 Winchester was also used for important state occasions with Henry VIII entertaining Emperor Charles V within the Great Hall. It was later used as the venue for Queen Mary to celebrate her marriage with Philip II of Spain. Shortly after the outbreak of the Civil War, Winchester was seized for the King in a surprise attack led by Sir William Ogle. However, in December 1642 it was attacked by the Parliamentary commander Sir William Waller who was in pursuit of a Royalist force that had been driven out of Marlborough. The Royalists retreated to Winchester which, unprepared for siege, was then stormed by the Parliamentarians. The Royalists withdrew into Winchester Castle but surrendered on 13 December 1642. Waller's men went on to sack the city. The Royalists recovered Winchester and thereafter it remained in their hands until their defeat at the Battle of Cheriton (1644). Again the Parliamentary force was under the command of Waller and he took control of the city. However, Winchester Castle defied the attackers and remained in Royalist hands. Oliver Cromwell then besieged the castle on 28 September 1645. Despite a determined resistance, the castle fell on 8 October 1645. Following the Civil War, Winchester Castle was demolished on the orders of Parliament. However, the Great Hall was left intact and was granted to Sir William Waller. He sold it to Winchester for use as a county court, a role it retained until 1874. Numerous high profile trials were held there including Sir Walter Raleigh (convicted of treason in 1603), John Burley (convicted of treason in 1647 for trying to rescue Charles I from Carisbrooke Castle) and Alice Lisle (convicted in 1685 for harbouring fugitives during the Monmouth Rebellion). The battle of Cheriton (1644), fought on the field shown above, saw Winchester fall to Parliamentary forces although the castle remained in Royalist hands. In 1683 Charles II demolished whatever remained of Winchester Castle (other than the Great Hall) and commissioned Sir Christopher Wren to build a new structure, the King's House, on the site. Charles II wanted a residence to rival the Palace of Versailles and work commenced at a significant pace. However, expenditure on the project was suspended after the accession of James II in 1685. Queen Anne intended to finish it but died before she raised the funds. Thus instead of being a lavish Royal palace, the incomplete building ended up being used as a prisoner-of-war camp for much of the eighteenth century. However, after the Napoleonic wars got underway in 1803, Britain's army swelled in size and there was an urgent need for new barracks. The King's House was converted and, during the course of the nineteenth century, became established in this role. The King's Palace was destroyed by an accidental fire in December 1894 and was replaced with a new purpose built structure. Adair, J (1973). Cheriton 1644 The Campaign and the Battle. Kineton. Hill, D (1971). Late Saxon Planned Towns. Antiquaries Journal 51. Historic England (2014). Winchester Castle, List entry 1001959. Historic England, London. Young, P and Holmes, R (1974). The English Civil War, A Military History of the Three Civil Wars 1642-1651. London. 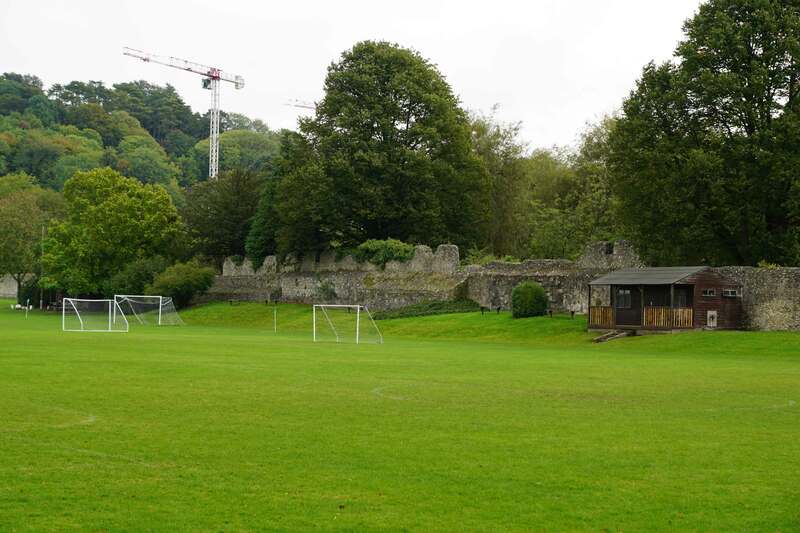 Winchester Castle was demolished by Charles II and accordingly most of the structure has gone. However, the Great Hall survives intact and is a fine example of its kind. The foundations of one of the castle's towers and underground vaults are also visible. 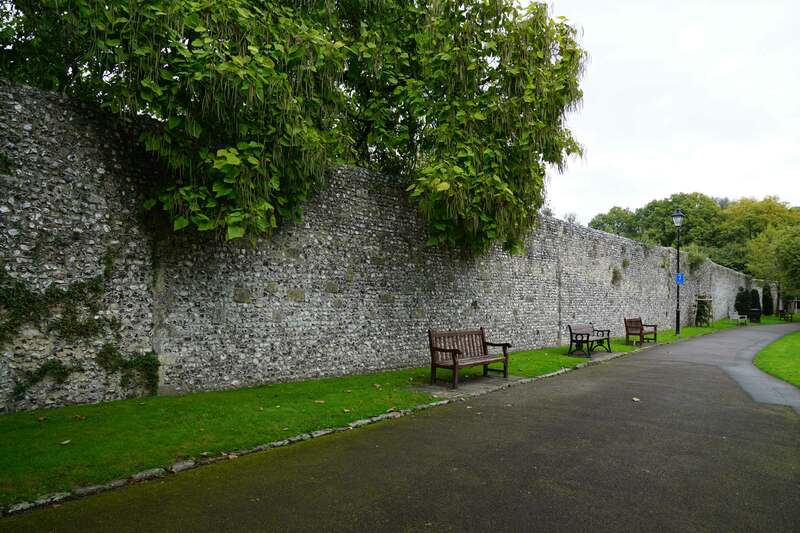 Portions of Winchester town walls also survive including the West Gate. 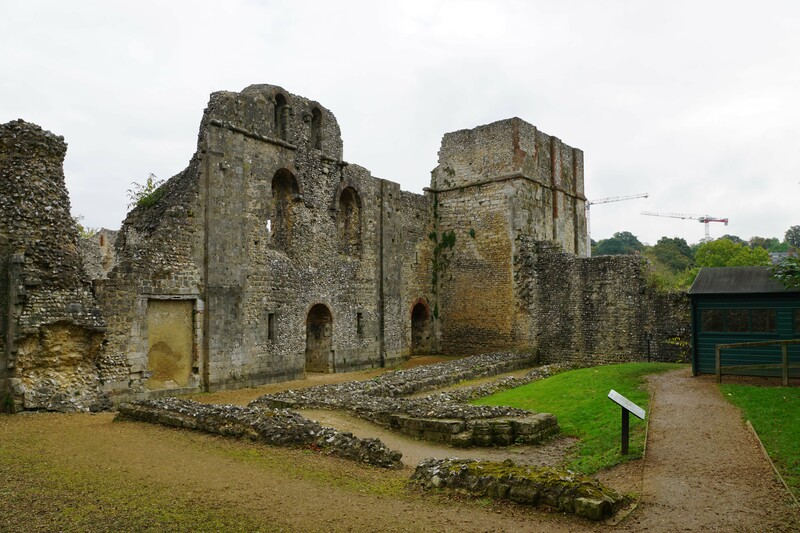 Wolvesey Castle, the fortified palatial residence of the Bishops of Winchester, is in ruins but open to the public and can be found near the Cathedral. 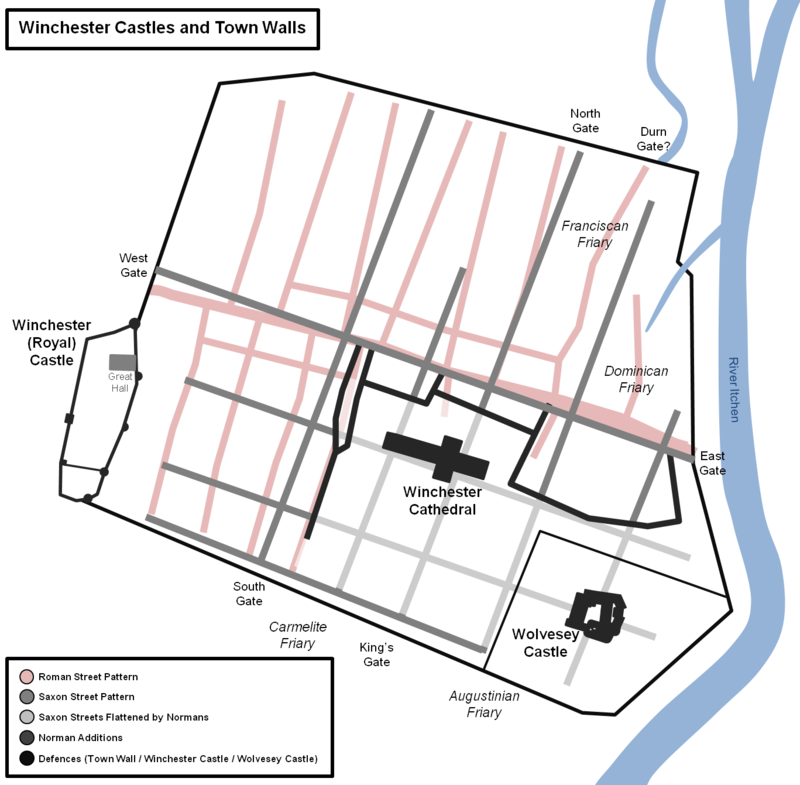 Winchester Castle and Town Walls Layout. The perimeter of the town's defences were largely defined by the Roman fortifications built in the second century AD and rebuilt in stone during the third century. When the Saxons refounded the town they laid out a new grid-like street pattern. The Normans stamped their authority over this with construction of the enlarged Cathedral and its precincts. Winchester Castle itself occupied an area in the south-west of the existing defences with numerous houses demolished to make space for the new fortification. Wolvesey Castle was located in the south-east corner of the town walls. Winchester Castle Great Hall. 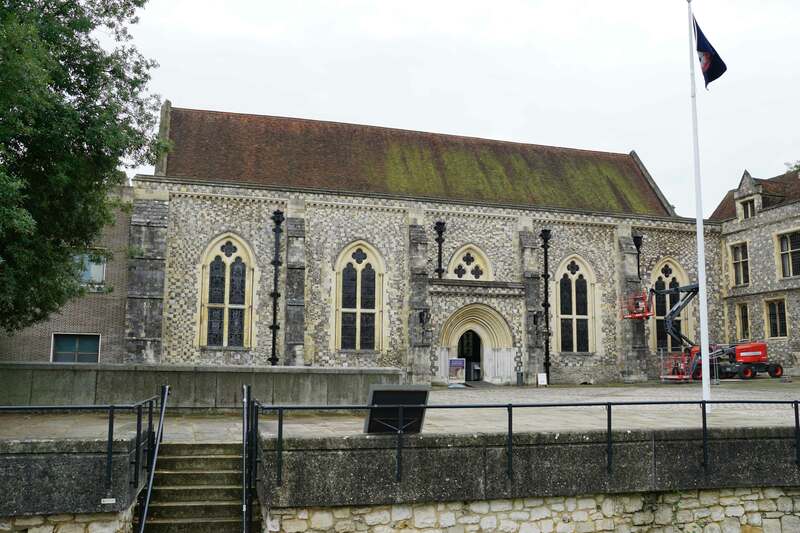 The Great Hall at Winchester Castle is a rare surviving example of its kind. It was constructed between 1222 and 1235 under the supervision of Elias of Dereham. It is divided by two rows of Purbeck marble columns. The roof was raised in 1348 and it was replaced in 1873. Over the years many court cases have been heard; one notable example was the trial of Sir Walter Raleigh in 1603. Round Table. 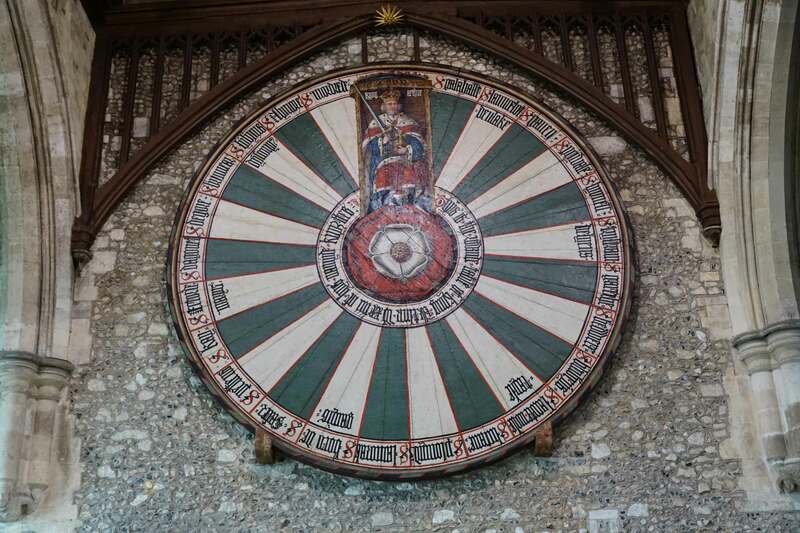 The round table on display in the castle was commissioned by Edward I in 1290. The legend of King Arthur was extremely popular amongst the nobility during the thirteenth and fourteenth centuries after having been popularised by Geoffrey of Monmouth's 'History of the Kings of Britain'. 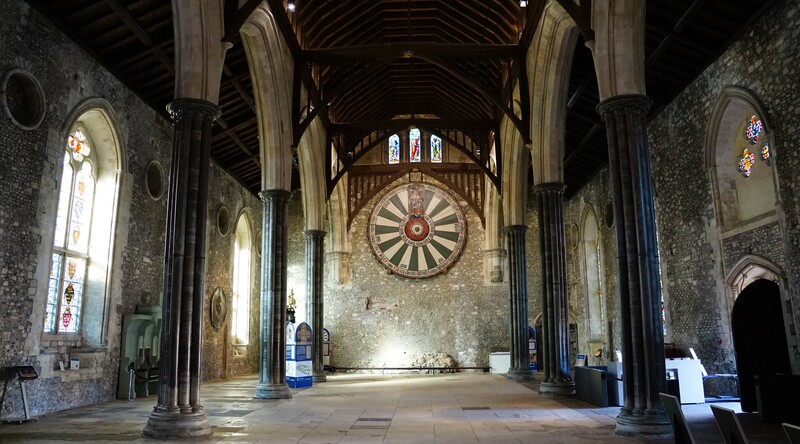 Arthurian themed tournaments were held and the round table at Winchester would have formed part of one such event. It was repainted by Henry VIII. Portchester Castle Keep. 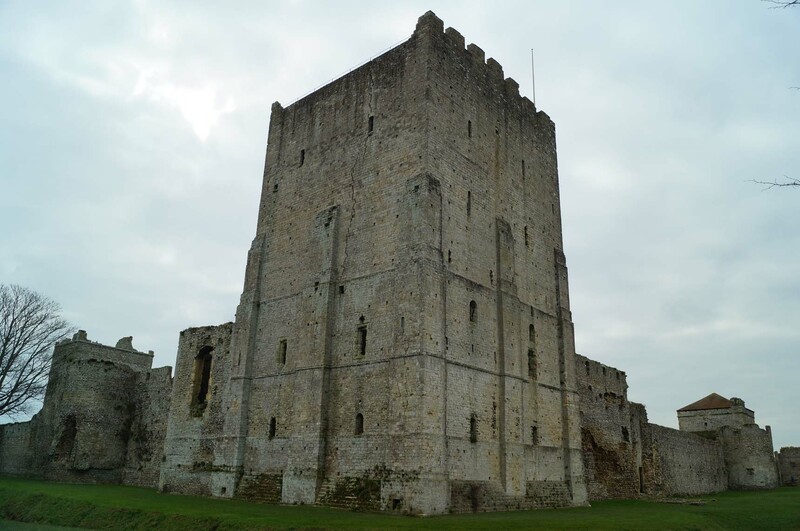 The Great Keep at Winchester Castle was destroyed after the Civil War but it was probably similar in design and style to that at Portchester Castle (seen above). Castle Tower. 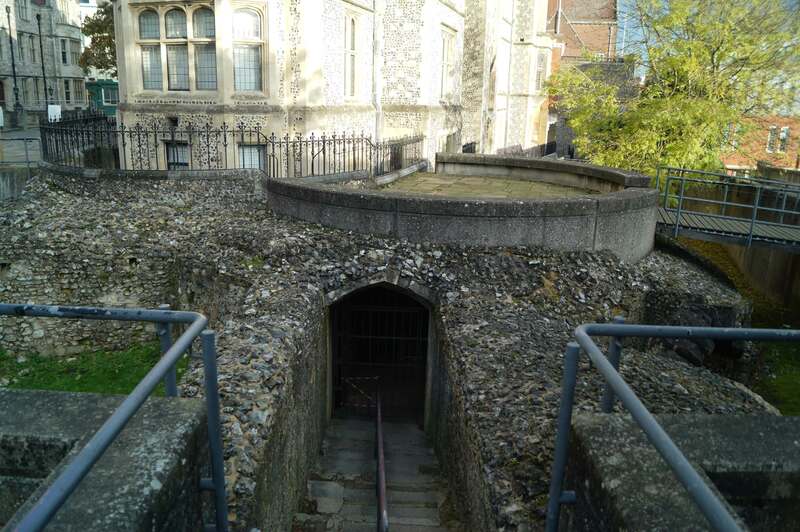 Portions of a thirteenth century tower that formed part of Winchester Castle have been excavated and are on display near the Great Hall. West Gate and Town Walls. The town's West Gate is the only surviving gate. Its lower parts date from the rebuilding of the town walls by Henry III but it was substantially rebuilt by Richard II in the 1390s. The gunloops and machicolated parapet date from this period. Portions of the town wall also survive particularly in the south-east near Wolvesey Castle. Winchester Cathedral. 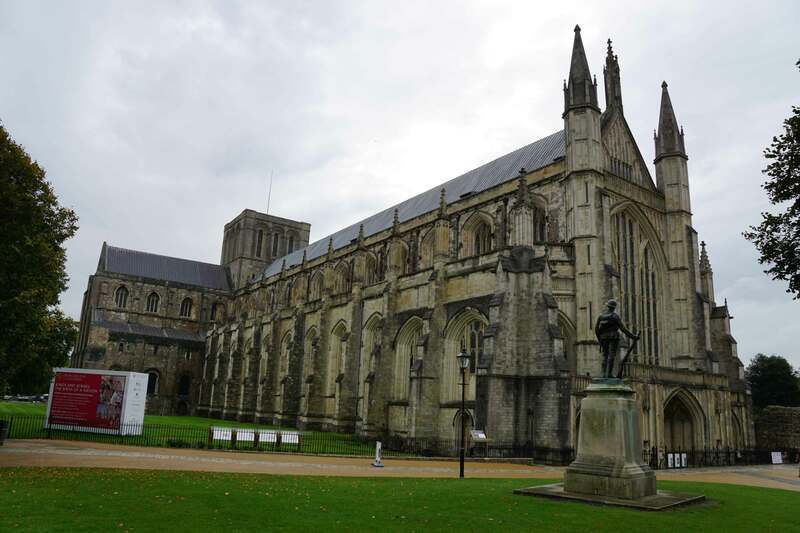 Winchester Cathedral was started in 1079 and replaced an earlier Saxon one in which King Cnut had been buried in 1035. At the time of its construction, the Norman Cathedral was the longest building in Europe. Wolvesey Castle. Wolvesey Castle served as the palace-fortress of the Bishops of Winchester. It played a key role during the siege of the town during the Anarchy. Winchester Castle is located at the heart of the city centre. The castle site, cathedral, Wolvesey Castle and the surviving segments of the town walls are all within easy walking distance of each other. Numerous car parking options are available across the city with two options shown below.